Are you using Hotjar yet? It’s a really powerful 8-in-1 website analytics and feedback tool that reveals exactly what your visitors think of your website, including the most common issues they have, and what they like the most about it. They now have over 200,000 online businesses signed up. But most users of Hotjar don’t really know how to get the most from it. They set it up, and can be disappointed with what they find, or don’t know its true potential. Especially because there are 8 different tools in it, each with their own advantages and mistakes to avoid. The tool offers excellent insights for improving your website conversion rate and sales (or leads), but only if you know the best ways to set it up and use it. 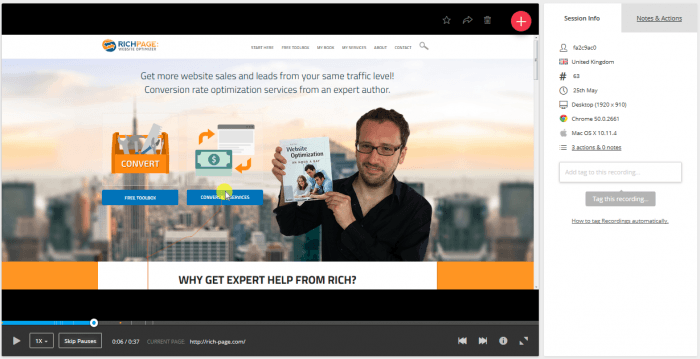 That’s why I have created this in-depth guide to help you maximize the true potential of this tool and transform the amount of sales or leads coming from your website. Before we get into details of how to use Hotjar for greatest success, I thought it would be good to give a quick overview of the main features of the tool and their benefits. 1: Visitor clickmaps: Much like CrazyEgg offers, these heatmaps let you see exactly what your visitors are clicking on (and is often quite different than you may expect). These give you great insights for knowing which elements on your pages need improving most or making more or less prominent. 2: Visitor recordings: These let you discover exactly what visitors do on your website, including mouse movements and how far they scroll. The recordings are often very revealing, and help you understand which parts of your website that visitors are most often having problems with, and their typical journey. 3: Feedback polls: This polls feature is similar to the Qualaroo tool, and takes the form of a single question in the bottom right corner of your website. This is one of the most simple yet powerful parts of the tool, and is excellent for gathering very insightful quick feedback on specific pages of your website. 4: Form analytics: Google Analytics can’t easily help you with this part – this feature reveals exactly which fields on your forms that visitors most often abandon on. Very important for using on your sign-up forms and checkout pages, the insights from this are vital for improving completion rates of your forms. 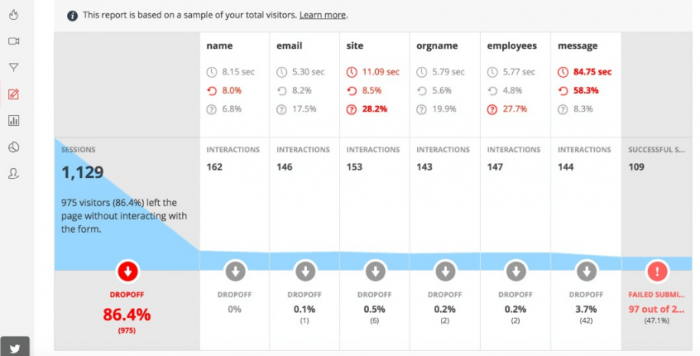 5: Funnel analytics: This feature helps you understand exactly how well your checkout or signup flows are performing, and the drop off rate of your visitors between each page of the flow. This helps you discover which pages in your funnel need improving first. 6: Visitor Surveys: It also includes a survey tool every bit as good as SurveyMonkey.com. Use it to find out in-depth feedback from your visitors, and exactly what they think of your website content and your offerings, and get feedback on how they would improve it. 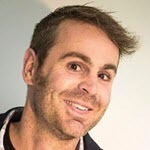 7: Incoming Feedback: This simple but effective tool allows visitors to leave ratings of your pages and website elements, and allows them to easily take and send screenshots of what they are having issues with or what they are loving. 8: User feedback recruitment: This helps you find participants for doing website usability and user research. I won’t be focusing on this in this guide though, as you need additional tools to run the usability research (like UserFeel.com). Time required for this part: You will need a few hours to setup each feature, and then will need to wait several days for responses (depending on how much traffic you have). New to Hotjar? You will of course first need to create a Hotjar account if you haven’t already done so. They offer a free basic plan, so I suggest you try that first. Then you need to add the tracking code which is very simple – they have install guides for each website platform too. This setup and collecting research part is vital, and there are many things to ensure you do, particularly for the poll and survey features. Don’t rush into using Hotjar out of excitement or you won’t spend enough time setting it up to maximize your website insights. 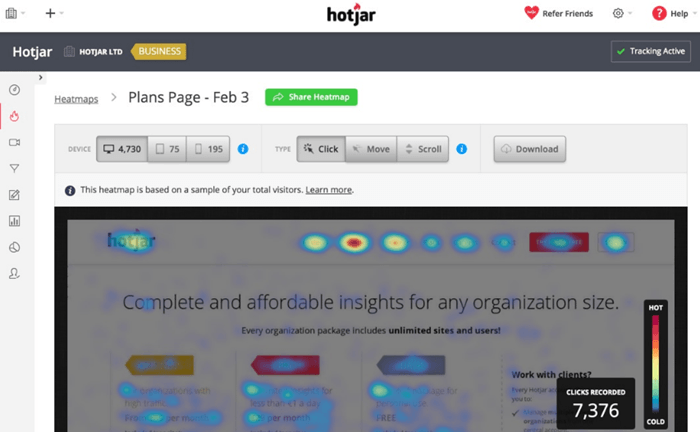 1: Turn on heatmaps for your key website pages. The first thing you need to setup are heatmaps. These help you understand exactly what your visitors are clicking on your website. And it’s often different than what you might expect! It’s really easy to turn on heatmaps, but don’t just turn them on for your homepage and a few other pages, you need to determine your most important pages to turn them on for. This should be your key pages and ones relating to your website goals, like your product or service pages, and your checkout or signup flow. You should also create them for your top entry pages, as these get seen very often and visitors will often judge your whole website based on them. You will need at least 500 views per heatmap that you create so you get a representative sample to review and gain insights from – the more views the better. 2: Turn on the visitor recordings feature. Next you need to turn on the visitor recording feature. This lets you start gaining excellent insights by watching your visitors website journey and most common issues that you will need to fix and improve. 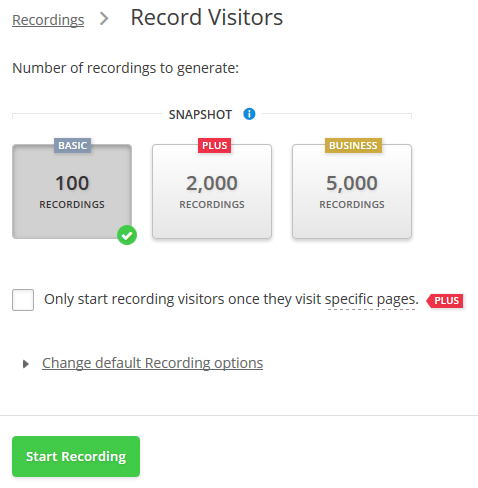 To get these recordings started, click ‘Record visitors’ on the recordings section of the tool and it will begin to record your visitors on your whole website – there is no need to pick specific pages. There are a few extra options, but I suggest you leave the default options on, and you can limit the recordings to specific pages if you have a pro level account. Ideally you need at least 50 recordings to review and gain insights from, and at least 20 that involve multiple page flows to get a good understanding of your visitors common whole journey. 3: Create a feedback poll for each of your key pages. This poll feature is one of the best ways to gain feedback, but if you don’t ask a good enough question or don’t choose the right page to ask it on, you won’t get very good insights. The key is to ask relevant questions for each of your key pages that provide you actionable insights – not just yes/no or generic questions. For example, if you have a prices or plans page, ask a question for gaining feedback about your pricing, like whether pricing seems reasonable or plan differences are easy to understand. You will get better insights running polls on pages relating to your website goals, and work very well on features pages, product pages, sales pages, pricing pages and signup pages. Homepages don’t work as well, as visitors often don’t know enough about what you offer to give feedback at that point in their journey. When you create these polls, the most important options are choosing the page to target, the type of poll (multiple choice or long text answers work well), giving visitors the choice to get a response, choosing 20 seconds for the trigger behavior for the poll (sooner and you risk annoying visitors) and most importantly, choosing a question to ask. You can actually ask more than 1 question and use logic to show a related question next that relates to their answer – this helps you get more detailed feedback. – Is there anything stopping you from purchasing today? – Which elements look most and least appealing? – Is there anything you don’t understand? – What do you think of the pricing of our service/product? – Would a free trial or guarantee compel them to try it? – What else could be added to make our service more appealing? You should aim to collect at least 50 responses for each page poll that you are running. Any less and you may not get a representative sample to gain insights from. This survey feature is excellent for gaining more indepth general visitor insights about your website, and complements feedback gathered by poll insights. So go ahead and setup a survey of less than 10 questions (any more and you will get lower completion rates). While setting it up, use the option to popup the survey on your website, but choose the trigger option to wait at least 60 seconds after visitors arrive or after a few page views, or you risk annoying them. To get more responses I also suggest you offer an incentive for visitors to complete your surveys (like a discount or free months access to what you are offering). – What was the main reason you came to this website today? – Did you find what you are looking for? If not, why not? – What features of our website and offering did you find most appealing? – What do you feel could be improved on our website? – Have you visited other similar websites? Did you prefer anything on them? – What do you think of the shipping and delivery options? – What are the biggest factors that influence your decision to purchase? – How easy was it to use our website? Did you find anything difficult? You will need at least 50 responses to analyze in phase 2. This should be quite achievable depending on your traffic levels. To gain more responses I suggest you create an additional survey customized just for your existing customers and send that out via email. Next turn on the funnels feature for your most important flow of pages like your checkout or signup set of pages. Setting up this funnel helps you discover at which pages that visitors most often drop out from – indicating issues and potential for improvement. E.g you may find that your billing page has a very high drop off rate. Setting up this funnel is easy and works much like creating a goal in Google Analytics. Just click ‘new funnel’ and enter names for each step and the corresponding page URL structure. You should set this up for your main conversion funnel like a checkout or signup flow, but also for most common visitor funnels that go back earlier in the visitor journey, for example from the homepage to the features page, to the sign-up page. Ideally you need in the very least 100 funnel visitor sessions to start gaining insights from. This last step is optional depending on whether you have long forms on your website – for example a sign-up form or a single page checkout. This form analytics feature of Hotjar lets you discover which fields on your forms that visitors abandon the most, and is something you can’t actually do with Google Analytics. For example, you may find out that people are confused about one of the questions you are asking in the signup form, or don’t like giving the answer to one of your personal information questions. This is also easy to setup. For every form you want to track, just click ‘new form’ and then enter the page URL that contains the form you want to analyze. Then you confirm which fields in the form that you want to track. You will need at least 100 form views to start getting reliable insights. Note: I haven’t mentioned turning on the last feature of the tool, user feedback recruitment, as you actually need other tools like UserFeel.com to be able to setup, gather, and analyze the actual user feedback. This part of the tool just helps you find people to recruit. Time required for this part: This is the most important part, and you ideally need to spend at least 4 hours reviewing the results from each part of the tool you setup. In this essential part you gather insights and website improvement ideas from each area of Hotjar that you just setup. Gathering these insights is the important conversion research part of CRO, and doing this leads to better understanding of your visitors and their needs, and therefore better website improvement ideas. Are visitors clicking or looking at parts of your page that you would expect? Are any elements being ignored that are important to your goals and need promoting better? What links in the navigation are clicked most or least? This gives you a great idea of visitor intent and for optimizing menu contents. Is anything being clicked on more than your main CTA buttons? This may indicate confusion or non engaging CTA wording. Are visitors not scrolling far down your pages and often not seeing key content? 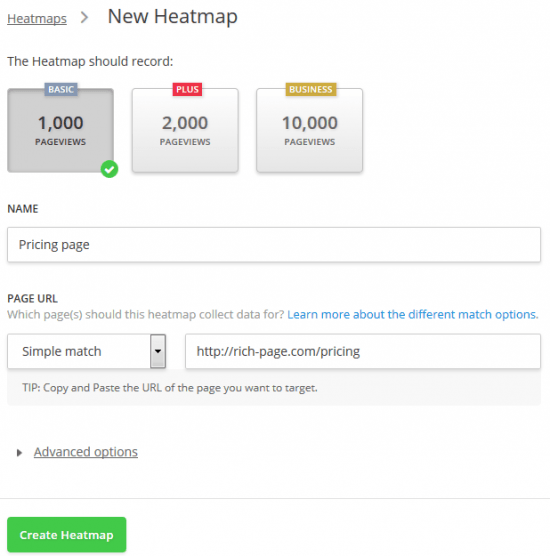 The goal is to create at least 10 heatmap insights you can use to improve your website sales or leads. Review recordings from your most important pages first – your homepage, your product or service pages, and your signup/checkout flow. You can setup filters to only see these. Watch at least 10 videos for each key page to get a feel for how users interact with each of them. Look for which parts of the pages visitors seem to get stuck on or don’t seem to notice. Look how often visitors click the back button or go the previous page, as this can indicate confusion. Look for any small errors or usability issues that you may not have noticed before. Review recordings on mobile devices too – these are really important for gaining insights into your mobile visitors and their challenges. When reviewing each video, use the tag feature for recordings using words that help you summarize what happens (checkout issue, confused, purchaser etc). Using these tips be sure to create at least 10 insights as you review your visitor session recordings. See which type of feedback response is most common if you are using multiple choice answers. The results graph lets you quickly see the most common responses. For open response questions, use the ‘word cloud’ results option look for common words so you can see patterns for what visitors are giving feedback most often about. If you haven’t got much feedback that is useful, consider changing your question to be more specific or change the topic slightly. Based on the feedback you have received, consider creating follow up polls to dig a little deeper into most common responses. The goal is to create at least 10 website improvement insights based on feedback from your visitor polls. Discover the most common answers for each of your questions and look for most common patterns. Understand which parts of your website they think need improving the most. Understand visitor’s purchase motivations – do you give them enough information to purchase? Discover visitor’s major issues using your website, and what they had most trouble finding or doing. Learn which competitors they like using, and reasons why. 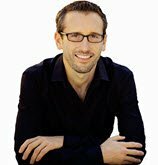 What is lacking on your website in comparison to them? Create at least 10 insights from the survey feedback that will help you improve your website. Check which page of the funnel has the highest drop off percentage – come up with insights why this might be. Any page with over 50% drop off rate is high and you should create insights for improving these pages. Look at the visitor recordings and heatmaps for each of the pages with highest drop off to help you come up with insights for improving these pages. Setup a poll for any of the pages that have high drop pages (if you haven’t already done so previously). 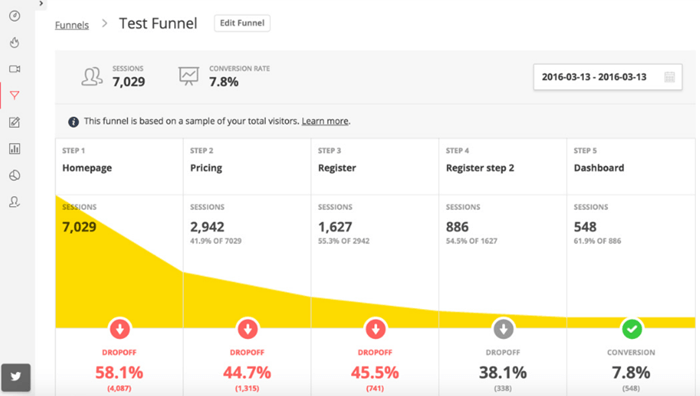 Look for the total conversion rate at the top of each funnel report. If this is for your checkout or signup flow of pages, anything lower than 30% conversion rate is below average and means you have big room for improvement (this is because the average shopping cart abandonment rate is 68%). The goal is to create at least 10 insights from the funnel report to help you improve your website. Check which form field has the highest drop off percentage, and think of reasons causing this. Are any of your form fields confusing that might be leading to higher drop off rates? Do you really need to ask for personal information in your fields? This lowers completion rates. 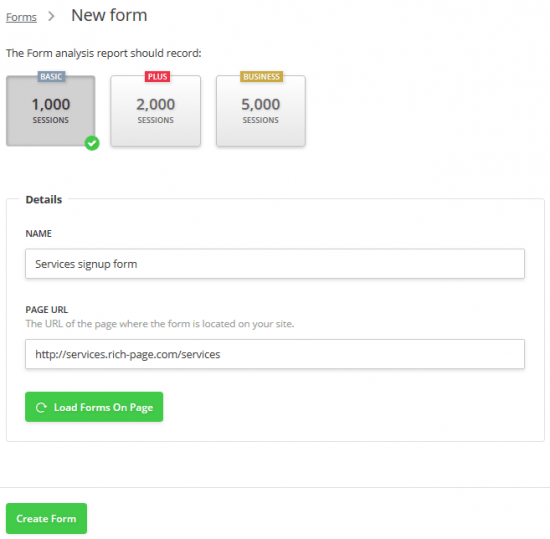 Do you need to make all of your form fields mandatory? Can you make some non-mandatory? Watch recordings of visitors completing your forms to see if you can get additional insights. How good are your error validation messages? This is important to improve to reduce form exits. From the form report try to come up with as many insights as possible to improve your key forms. Note: In addition to these Hotjar tool insights, it’s also essential to look at your Google Analytics reports to find additional insights like the bounce rate and conversion rate for your key pages. You should also run usability tests with your target audience using a tool like UserFeel.com to gain additional feedback and gain insights from that. Time required for this part: You should spend at least 3 hours creating ideas based on insights, ideally brainstorming with other team members. This is where things get exciting and you start to launch website improvements based on the insights you have gathered using Hotjar. But to ensure greatest chances of increasing your website sales or leads, you need to know how to best turn the insights into ideas, and know what to launch first for biggest impact. 1: Turn your insights into improvement ideas. A short descriptive name for your improvement idea. A hypothesis for each idea (the reason why you think it will have a good impact). The insights used to create each idea (for example insights from Hotjar or web analytics). Estimate the likely impact the idea would have on increasing conversions and sales (ranked 1 to 10, with 10 being highest potential). List how much traffic each page gets relating to each idea – the more the better (ranked 1 to 10, with 10 being highest traffic). Estimate how easy the idea would be to launch in terms of design and development (rank 1 to 10, with 10 being easiest). 2: Prioritize the improvement ideas based on highest impact. Rather than guess at what improvement or test idea to launch first on your website (which can lead to varying success), with the information you listed for each idea you can now prioritize and determine the ones that will maximize your chances of increasing your website sales or leads. To do this prioritization, on your ideas sheet simply sort the likely impact column to show highest rated ones first. Then look for the ideas towards the top that have the highest ease of launch rating – these are going to give you the quickest and biggest impact on improving your website. These easier to change high impact ideas are known as low hanging fruit, and typically will involve changing simple things on key pages like headlines and call-to-action buttons. 3: Start launching highest potential ideas first, and progress through the list. Once you have determined the improvement ideas that will likely have biggest impact and easiest to implement, start launching the ideas one at time. You will often need to get your website designer and developer to help create the visuals and code. Don’t forget to get help from the marketing team to help you writing better headlines, wording and call-to-actions too. For each improvement you launch, monitor the impact on your key metrics in your Google Analytics reports, both for the page you are trying to improve (lower exit rate and higher conversion rate) and for your website as a whole (increased website conversion rate and improved shopping cart/signup abandonment rates). Ideally you should A/B test a few variations for each improvement idea as this helps you experiment and find the best performing variation for your ideas. For low traffic pages this A/B testing may not be possible though – this guide will help you if you low traffic. After you have launched about 5 improvements to your website, you should start to see some great impact on increased conversion rates, sales or leads. Don’t stop there though, keep working through the list until you have launched all of the ideas you created. Using Hotjar and this guide should really help improve your website sales or leads, and ideally you should repeat this improvement process at least one a year on your website, and definitely when you have just changed major elements on your website. Now over to you – have you started using Hotjar yet? What is your favorite tool to gain insights? I tried this tool last year for a while but didn’t learn much from it. Looks like I didn’t really know what I was doing though – I will have to try it again and use some things in this guide. Thanks Rich! Thanks for the comment Andrea. Yes, many people seem to rush into using Hotjar and not really know how to make best use of it. I’m sure next time you will have better results though. 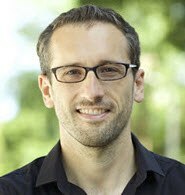 Hi Rich! Thanks for the review. Have you also tried Inspectlet? if so, which do you think is better? They have similar features. Thanks for the comment Emmerey. I haven’t tried Inspectlet yet. It looks very good but only offers session recordings, heatmaps and form analytics. Therefore I still recommend Hotjar more because they also have polls and survey tools which are essential for gathering visitor insights.